Joshua Fox from the DM stealing from us once again! He's one of the current frontrunners on The Bachelorette. And despite Ali Oetjen's season being just two episodes in, it seems that Charlie Newling, 31, may not be winning the show despite early speculation. 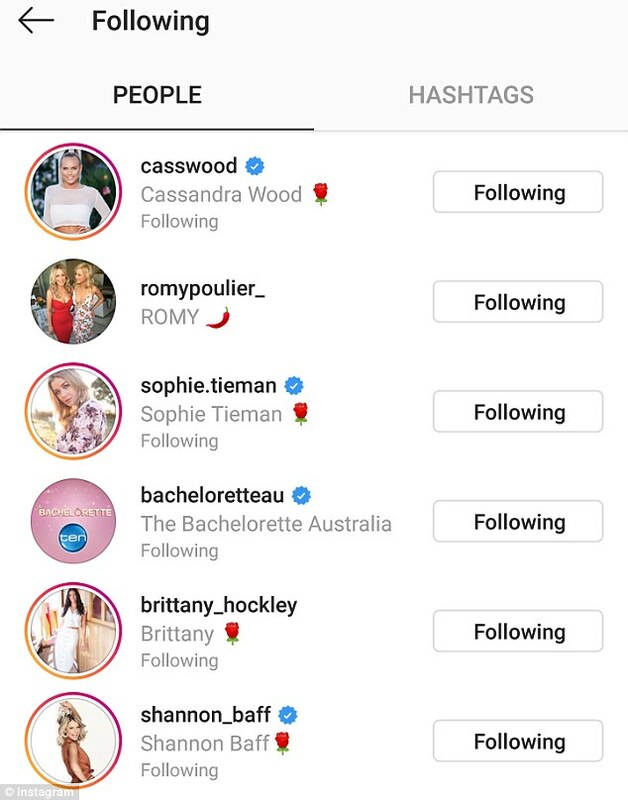 Other contestants from Nick Cummins' season he has now followed include Romy Poulier, Shannon Baff, Brooke Blurton and Dasha Gaivoronski. He has also reached out to stars from previous years, including Megan Marx, Elora Tahiti and Florence Alexandra Sophia by following their profiles too. If Charlie had indeed found love with Ali on the show, it would be unlikely that he would now be trying to connect with so many single women. Charlie's choice to reach out to so many single stars of the franchise seems suspicious given that the second season of Bachelor In Paradise is currently casting. @Sundy wrote: Well hello. Could have saved themselves a lot of grief if they just followed what we had said. @spangler wrote: Maybe their edit of Taite is to align with Ali's past of always going for the bad boy? That's all I can think of... Or they want one of the guys for The Bachelor next year (since the celebrity thing clearly doesn't work) and so instead of making the finishing couple look good, they are just gonna promote the guy they want as Bachelor to try and improve their brand-name, considering how it's taken a bit of a hit with the very vocal and angry fans of the last season. I think you're absolutely spot on @spangler. @AllAboutLove and I are already convinced they want Todd for the 2019 Lead. Lots of supporting evidence on his thread here and I would include Taite's invisible-one-minute-bad-boy-the-next edit as evidence also. If that's not their plan, I have absolutely no idea why they're presenting Taite in this way unless they literally hate Ali because, unless his edit takes a dramatic shift, he is NOT going to be a popular choice, IMO. Like I posted in my previous post in this thread, Taite has to be presented this way when the fan favorite is F2 and leads to next lead like Matty J. Only way that the show can get viewers behind next lead if he's F2, is to build him up over the F1. I'd think there'd be a chance for a HEA ending if Todd was F3. But, as he has been sleuthed/speculated to be F2 (see SC thread) as runner up that doesn't allow for a HEA edit for lead/F1 when the fan favorite is F2. The only time there can be a HEA ending for F1 is if the fan favorite is not F2. So like SamFrost's F3/Richie worked for next lead in the F3 spot but considering this season, I don't see them being able to make anyone but F2 the next lead. So the HEA for F1 edit gets put to the wayside (either negative or hidden) and the F2 will be more obvious and the forefront. After Nick's season, to go with a F2 like Matty J (who was preferred over F1 and then became lead and is a success still with his F1) it's a no brainer for TPTB to try to replicate that again. It will "redeem" them in the public's eye to go that route and optics is what they will look for imo and that's someone who genuinely wants love and has been heartbroken (look at Ali sobbing at FRC with F2 imo) and it gives TPTB their chance to get their "optics" redemption, just like with Sam Frost. Indeed. It's all up to you Todd. No pressure. I certainly think TPTB would stand a MUCH better chance of finding a partner for Todd than someone like Chris Brown. They did a cracking job with Laura. Matty was so besotted with her it was like she was the Lead and he the contestant. He wasn't the most eloquent Lead but the love story was undeniable and I think we need another season like that. Matty is still beloved by TEN and their golden boy. His ratings were pretty good too. Some may not care for him as lead and that is usual with contestants-lead that they will be less liked but overall he was a success relationship and ratings wise. ETA: In regards to next lead and Ali's ratings. Georgia's season had the lowest ratings ever before Matty J was cast so him not being well-known due to low viewership did not mean anything ratings-wise. It shows that even a low rated Bette season can still result in a Bach lead producing good ratings and that a low rated season can still produce a contestant as lead. Perhaps just this season could also end up like Georgia who with her low ratings produced the only successful Bette relationship so far and the next lead from her season like Matty J who also has a successful relationship so far.